In a bowl, mush up the tuna chunks until they are, well, mushy. If you want, to mellow the taste of the onions and garlic,you can sweat them lightly, Set them aside to cool. Add them to the mushy tuna and mix. Add the bread crumbs, then the garlic salt, then the egg. Mix until you have a hamburger-like mixture. 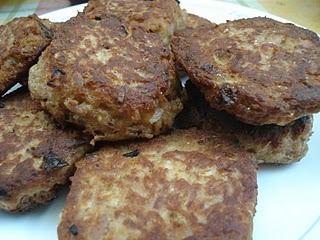 Form into patties and fry until nice and golden brown. They go really well with ketchup, chili sauce, or honey mustard sauce. Sometimes, I add things like parsley or Parmesan cheese to change the flavor, but the basic recipe is the one above. Oh, and if you want a little New Orleans Crab Cake thing going, add mayo, about a tablespoon. Basically, it’s something that has plenty of possibilities for customization so knock yourselves out. Did I mention they’re yummy too? They are. I was just reading Olive the other day. They had a recipe for a tuna burger with chili based sauce. Yours seems alot easier and quicker to make. Would have been nice to see the patties in between buns. They look like hockey pucks. Hi Gina, I usually serve them with pasta or rice, hence the bunless pucks. My family's not too big on sandwiches for meals so they usually eat these with those staples instead. Hey Franco. It isn't fancy at all, I guess, that's why its simple to make. And since I cook with a very limited time frame (since I usualy come from work) I need something that can be done as quickly as possible.